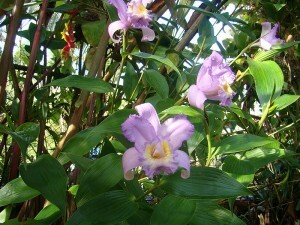 Sobralia orchids have large and showy flowers, resembling Cattleya. The only disadvantage of the majority species fo these magnificent orchids is that their flowers are exceptionally short living – each flower lives only for one day, but some Sobralia species, for example, Sobralia caloglossa have flowers lasting for several days. Their beauty is extremely short lasting, because their ephemeral flowers possess special digestion enzymes, causing their flower to bloom only for a short time. A good news about Sobralia is that each stem gives birth to several, successively opening flowers. Short live of flowers is compensated by extreme beauty of Sobralia flowers and their large size – some species have up to ten inch wide flowers, which are also often fragrant. 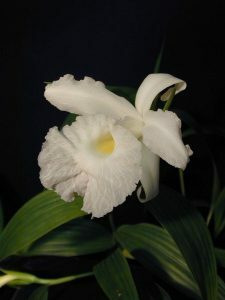 And do not forget to say that Sobralia orchids are particularly easy to grow, so the only reason that they are not so popular, as they could be is their short lasting flowers, and given the fact that they are large sized some choose more long-lasting flowers to grow than extremely lovely Sobralia. But if you choose Sobralia, their beauty and easiness block the disadvantages of large size and short flowers live and will make you true Sobralia fan. Though their flowers look very similar to Cattleya’s ones (and some Sobralia orchids even were classified in Cattleya genus), they are not related and actually completely different in their anatomy and ecology. Sobralia orchids are terrestrials or epiphytic sympodial orchids without pseudobulbs, they have reed-like stems with veined leaves and terminal inflorescences. They are often large sized; flowers are big, Cattleya-like and very short lasting. Sobralia macrantha has fragrant, pink 10 inch wide flowers. Sobralia dichotoma – type species – has extremely bright red and fragrant 4 inch wide flowers. Sobralia decora has lovely pink-lavender 4 inch wide flowers, also fragrant. Sobralia sessilis has lovely, 4 inches wide lilac flowers. Sobralia caloglossa blooms for a month or even more, new 4 inch wide flowers open one after another. What’s about Sobralia care – it is not very difficult. They are warm to hot growing orchids but will tolerate lower temperatures with lowering watering regimen, so don’t overwater them. The light should be bright, but without direct sunlight – some species actually prefer semi-shade, so light levels should be something like as for Phalaenopsis or Oncidium orchids. Given the fact that they are mostly terrestrials, it’s better to grow them potted in soil mixture for terrestrial orchids with some bark and sphagnum. Watering should be ample in summer and moderate in winter, you should also reduce fertilizer use in winter.